Festival and Rhino, together with Warner Music Australia, have teamed up to present an Australian first. Released February 10, 12 Inch Dance: Australian 80s Pop is the first ever CD collection dedicated to original period extended mixes of classic Australian hits from the 80s. Available as a 3CD set and digital download, it includes 37 rare mixes – the majority of which have never been reissued in any format, and never before been digitised. The album includes classic hits from a who’s who of 80s Aussie pop, including Icehouse, Real Life, Kids In The Kitchen, Split Enz, Pseudo Echo, I’m Talking, The Dugites, Kate Ceberano, Hunters & Collectors, Eurogliders, Boom Crash Opera, Models, Flowers, Wa Wa Nee, Stephen Cummings and more. The 1980s was of course the decade the 12” single came into its own. More than just a marketing tool, it enabled artists and producers to present fresh and expansive remixes of dance-oriented pop tracks which were perfect for club DJs and those wanting dancefloor time with their favourite radio hits. The art of the re-mix obviously had a massive influence on pop music to come. Compiled by writer David Nichols (former Australian ‘Smash Hits’ features editor in the 80s, co-author of ‘Pop Life: Inside Smash Hits Australia’ and author of new book ‘Dig: Australian Rock and Pop Music 1960-85’), 12 Inch Dance: Australian 80s Pop is something that fans of Australian 80s pop have been wanting for years now. It is also a uniquely Australian addition to Rhino UK’s own 12 Inch Dance series of 3CD Releases (listed below), which features a massive list of the biggest international pop artists of the era, and which are also being released physically in Australia for the first time. 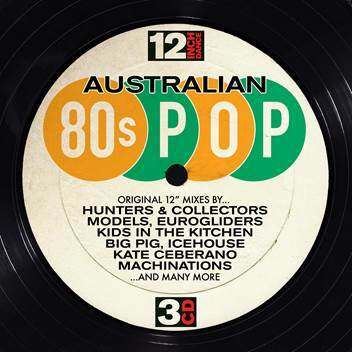 12 Inch Dance: Australian 80s Pop is out February 10 on Festival/Rhino through Warner Music Australia.